Feel free to review our two certification training programs to determine which is best for you. The Certified Optimal Thinking Trainer Program provides personal and professional optimization education to empower individuals and organizations to be their best — regardless of the circumstances. The Certified Optimal Thinking Trainer Program puts into practice information from the revolutionary life-optimizing book Optimal Thinking: How to Be Your Best Self and Optimal Thinking programs and seminars. We are committed to educating a generation of Optimal Thinking leaders to empower others to maximize their personal and professional success. The program provides students with a road map to best develop this competency and live life to the fullest. You learn how to conduct a 90-minute follow up meeting for Optimal Thinking Self Assessment and Optimal Thinking 360º Assessment participants. You also learn how to present the full-day Optimal Thinking: The Motivator of Peak Performance seminar — and empower others to consistently make optimal choices in their personal life and career. 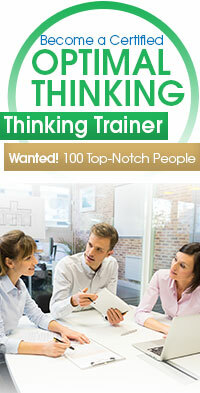 Certified Trainers can also sell and distribute the entire line of Optimal Thinking seminars, products and services. Certified Assessment Associates may present 90-minute follow up sessions (within specific guidelines) with individual End Users and/or Corporate Optimal Thinking 360 Online Assessment clients. You interpret the nuances in reports, provide additional options, and further the optimization process. The Certified Assessment Associate Program involves “learning by participation” exercises to ensure information is best applied. You will be required to obtain an 85 percent score utilizing open book examination, and demonstrate proficiency in the exercises provided. Upon successful completion, you will be awarded a Certificate recognizing your certification, and your name will be listed on the Certified Assessment Associates database. You can also sell the Optimal Thinking Self-Optimization and 360° Assessments and become a profit center for these programs. Why is Certification Worth Your Time and Effort? A credentialed Optimal Thinking coach demonstrates optimization knowledge and skills and a commitment to the highest professional standards and code of ethics. This credential provides you with credibility as an optimization professional. How Will Certification Benefit You? 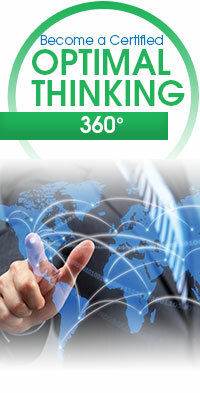 Your Optimal Thinking certification is a critical step in personal and professional optimization. Achieving certification demonstrates your commitment to the highest standards in talent optimization and professional coaching. Certification provides assurance to your clients that you have met the specific requirements from our global optimization training program.